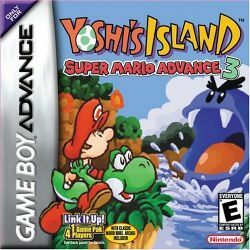 Super Mario Advance 3 is the third game in a series of four to bring classic Super Mario titles to the portable Game Boy Advance. This volume contains a Super Nintendo title that was launched late in its life time, Yoshi's Island, the sequel (or prequel really) to Super Mario World. It also contains new features including six brand new levels, and the battle mode homage to the original Mario Bros. game (which was included in every single version of Super Mario Advance). This page was last edited on 16 October 2015, at 05:13.